Protein Pancakes are a great way to minimise fuss in the kitchen. After all, who’s got time to find recipes, buy and prepare ingredients? Then you have to consider the macronutrient balance, and make sure it fits in with your needs. If you do have time for all time, then you’re one of the lucky ones, or you’re just gifted at time management. With this Protein Pancake section, there’s no need to worry about mixing protein powders and flours and balancing the flavours and consistency. The hard work has been done. Just add fluid, mix and get start frying like tomorrow will never come. Protein Pancakes can be finished with all of your favourite toppings, like chopped banana, diced strawberries, low-fat yoghurt or honey. Fresh blueberries and vanilla yoghurt works well too! If you’re trying to minimise calorie intake—yet still enjoy your meals!—try topping them with a small amount of low-fat yoghurt, then drizzle some low-calorie flavoured syrup over the top. The yoghurt will add a nice creamy consistency, while the syrup provides a flavoury punch. For a high calorie breakfast, try American-style with pancakes and syrup on the side of scrambled eggs, toast, hash browns and tomatoes. There's not much you won't be ready for after a breakfast like this! 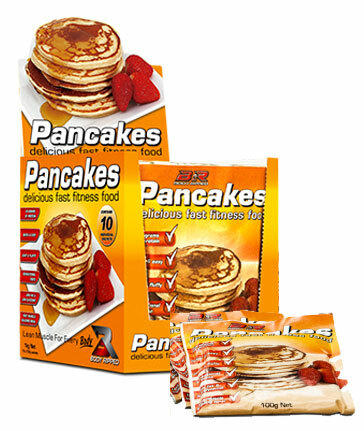 You can rest assured that each protein pancake is filled with high-quality protein containing all of the essential amino acids required to trigger muscle protein synthesis. This means—as with any high quality protein source—the anabolic pathways of the body are stimulated, ensuring that muscle is rebuilt and repaired. So if you're aching for something different for breakfast, or if you need a new snack for on the go (pikelets would work), given protein pancakes a go!